﻿We are lucky enough to have two of the most high spec wetsuit brands in our shop; ION and Severne. They focus on bringing the best in quality and performance. Designed by riders that use the gear everyday so you know you are getting the right stuff. Completely re-designed for the modern day. Come check them out for your self at our Wellington store! With over 25 years experience in watersports, we have encountered almost all conditions in the country. Wellington, Taranaki, Tauranga, Auckland, Napier, Otago and many more. Suitable for surfing, windsurfing, kitesurfing and paddle boarding! *Below are our most popular suits! The STRIKE SELECT is the Don of high-tech wetsuits. Shred in style, crash in comfort and revel in its luxury of Plasma_Plush lining and the brand new Water Gate 3D construction. The increased Single Lined back panel results in outstanding freedom of movement, while the Power_Seam gives great stretch and protection of the seam for a longer lifespan. Having completely overhauled the panel layout with less seams, we can ensure more warmth and stretch than ever before. Have confidence in this premium suit. This suit is aimed at core riders across all watersports, but more specifically wind sports addicts who need extra protection against tailwinds and a premium suit to match their dynamic personality. The ONYX SELECT screams style with its slick colour and classic finish. The high-tech design offers uncompromising quality and outstanding performance. The new Single Seam in the lower leg offers limitless stretch and durability. In addition, the Ninja Spine further enhances freedom of movement. The new improved chest zip offers ease of entry, while the Sweep Cut at the shoulders enhances the paddel reach. There's no trick too big or barrel too heavy for this champion suit. This suit is aimed at riders who push boundaries, rely on ultimate freedom of movement and high-tech performance to support their ambitious style. - Chest zip or zipfree to enable the back panel complete stretch. - Thermofleece body panels are quick drying and maximise warmth. - Anti-abrasion panels to reduce wear from windsurf deck grip. - Windsurf Fit shaping minimise muscle fatigue and maximise comfort. The chest entry on the Primo suit is specifically adjusted for a windsurfing stance, with any unnecessary elastic straps removed and the zip head placed low and covered to avoid irritation when your head is looking forward over your shoulder. The zip allows for easy one-handed closure rather than a complicated open-ended zipper. The precision contoured arm panels combined with the stretchiest materials make windsurfing in the Primo the closest thing to year-round summer. Windsurf Fit means you’ll keep charging at full strength all day long. 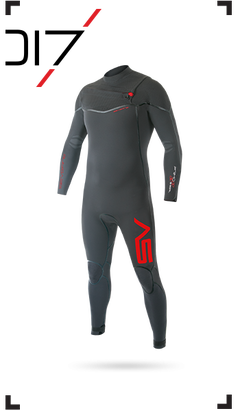 ​The Exo suit is a high-performance back zip wetsuit with Windsurf Fit. 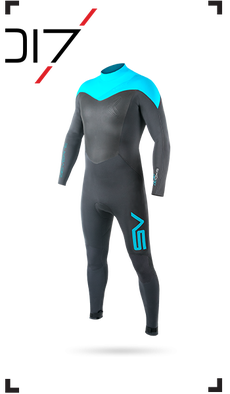 With single-lined material on the chest and back to reduce wind-chill and maximise solar heating, these wetsuits focus on functional warmth and flexibility. The back zip enables easy entry, and Windsurf Fit means maximum comfort. A modern twist on the timeless classic, the ONYX AMP takes on a mélange of contrasting colours. The combination of our renowned Hot Stuff lining and new Ninja Spine makes this suit the perfect blend of quality, comfort and protection. With improved positioning of the chest zip and additional tape sealing on the inside, this is a suit with so much swagger, it’s up to you to do the performing. The ONYX AMP's little brother, makes a bold statement with its top-notch design and flex boosting features. Prime protection is given to those riders looking to get their first airs, with the L-Tex knee protection and durable Nylon material, which make this suit incredibly robust. Match your personality with one of our two colourways and get ready to look good and feel great! This suit is for the front zip fanatics looking for outstanding performance to enhance their on-the-water experience.